Raaga.com: After Shatrughan Sinha, Bollywood action star Akshay Kumar meets Delhi Chief Minister Arvind Kejriwal! 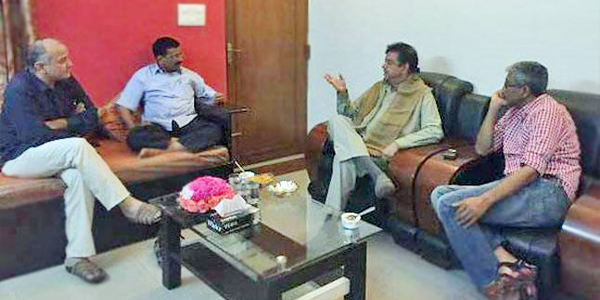 After Shatrughan Sinha, Bollywood action star Akshay Kumar meets Delhi Chief Minister Arvind Kejriwal! It seems Bollywood has found a solace to their woes in the Delhi Chief Minister Arvind Kejriwal. Readers may remember a few weeks ago actor and politician Shatrughan Sinha, had met the Chief Minister and proposed to set up a Film City and a FTII kind film institute in New Delhi to solve the film shooing hassles of Mumbai and help the agitating students of FTII, who are being harassed by the controversial appointment of Gajendra Chauhan as chairman of the premier institute. Recently action star Khiladi Kumar aka Akshay Kumar too visited New Delhi in connection to the promotion of his latest film SINGH IS BLIING. Meanwhile he also attended a funds raising event to help draught-hit farmers and donated Rs 90 lakh for the welfare of the drought affected farmers of the Marathwada region who are committing suicides due to scarcity of water. After the event Akshay Kumar took out time and met Arvind Kejriwal to seek a solution the grave issue of farmer’s suicide. According to reports during the 30 minutes meeting with the Delhi CM Akshay Kumar spoke generally to problems related to the farming sector, growing farmers’ suicides and ways to help farmers get out of the distress situation.